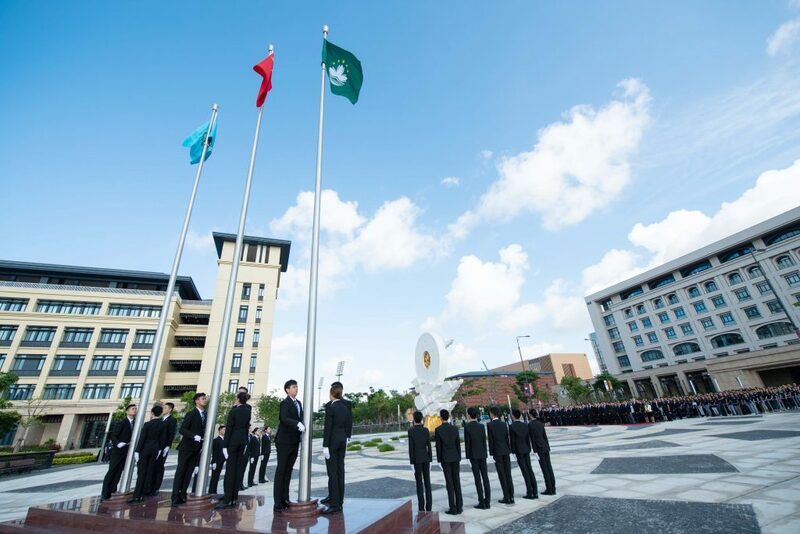 The University of Macau (UM) held its first flag-raising ceremony to celebrate the congregation day on 26 May, becoming the first public university in Macao to have held a flag-raising ceremony on campus. Officials from the central government and Macao SAR government, prominent members of the community, as well as more than 800 faculty members and students attended the ceremony. Some students say that the ceremony increased their sense of belonging to China. 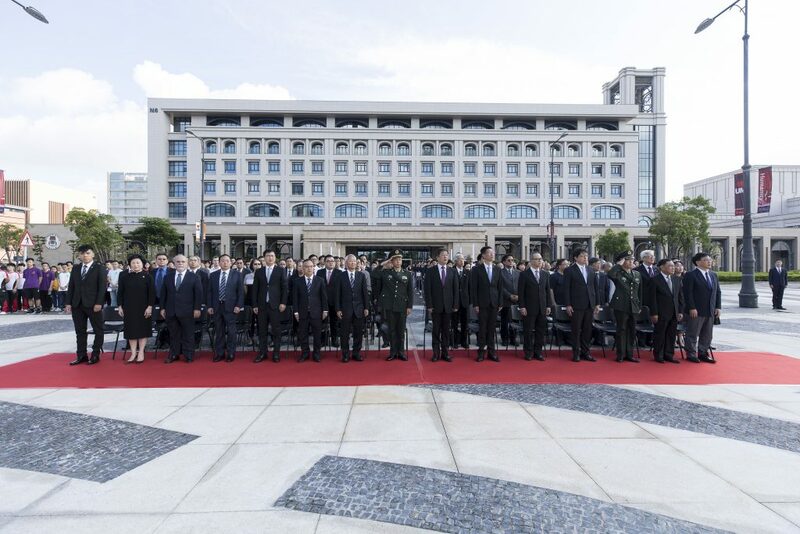 Guests who attended the ceremony included Zheng Xiaosong, director of the Liaison Office of the Central People’s Government in Macao; Liao Zhengrong, commander of the People’s Liberation Army Macao Garrison; Zheng Xinyou, head of the Department of Public Diplomacy and Information of the Office of Commissioner of the Ministry of Foreign Affairs of PRC in Macao; Lam Kam Seng, chair of UM’s University Council; Sou Chio Fai, director of the Tertiary Education Services Office; Lou Pak Sang, director of the Education and Youth Affairs Bureau; and Yonghua Song, rector of UM. The flag-raising team is formed by 21 UM students, of whom 15 are male students and six are female students. The director general of UM’s Students’ Union served as the standard bearer. 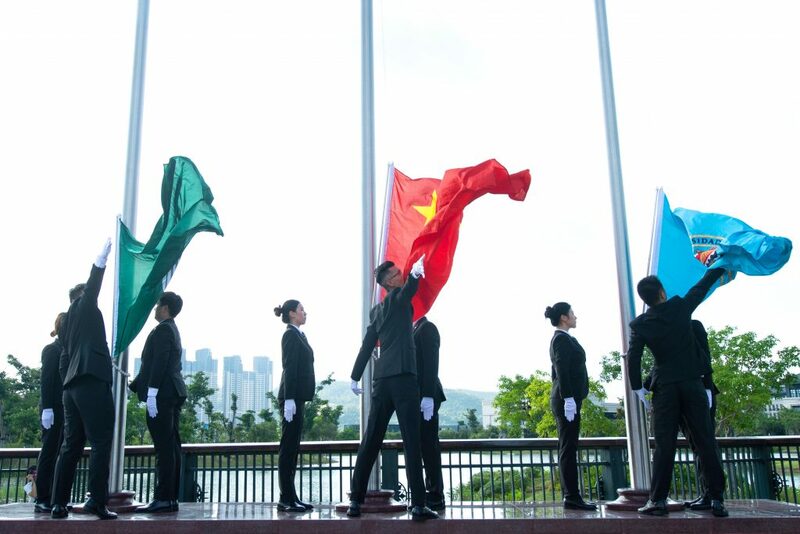 To ensure that the ceremony would run smoothly, the team received training at the People’s Liberation Army Macao Garrison in Taipa, and practised on campus for several days with an instructor from the Macao Garrison. MC Ouyang, a member of the flag-raising team and director general of the Students’ Union, feels honoured to be the standard bearer in the first flag-raising ceremony at UM, saying that it increased his sense of belonging to China and he now understands that the flag-raising ceremony is a solemn affair and every part of the ceremony needs to be meticulously planned and executed. He adds that the ceremony further enhanced his love of China and strengthened his national identity. Another flag bearer, Chen Si Han, says that he hoped to become a flag bearer when observing the flag-raising ceremony as a child, and he is very happy to have the opportunity to make his childhood wish come true. He adds that the flag-raising training helped improve his self-discipline and team spirit, enabled him to learn more about the history of China, and increased his patriotic sentiments towards his homeland. 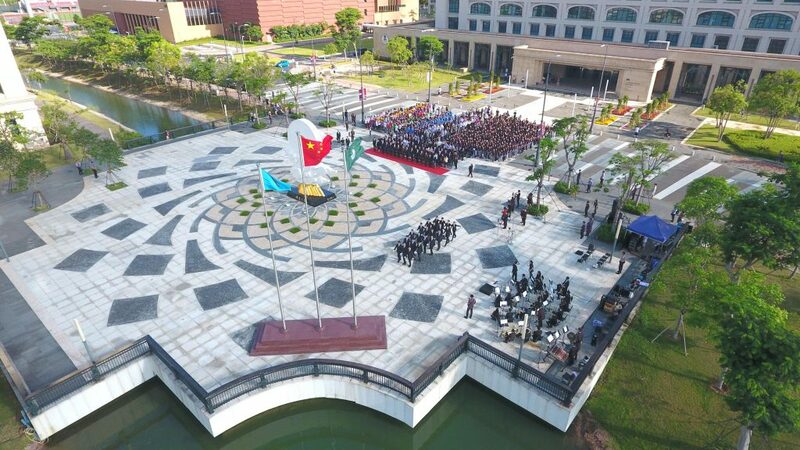 In the future, UM will hold flag-raising ceremonies on days with important ceremonies and days of significance, including the congregation day, the convocation day, Macao SAR Establishment Day, and the first day of the new year.